Take a walk through time visiting the places that housed the Great Bed between 1590 and 1869. The walk begins and ends at Place House - Ware’s timber framed Mediæval Manor House - and takes around 1 hour. 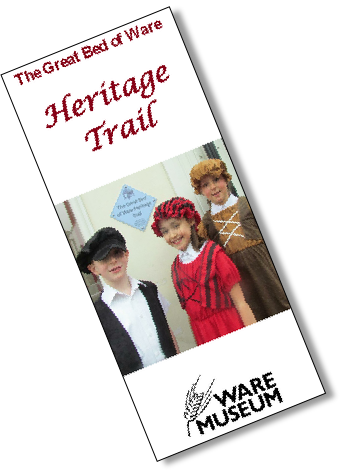 The Heritage trail has been designed for School Parties but is also intended for visitors of any age who want to learn more about the history of the Great Bed of Ware. Ware Museum is especially grateful to the following bodies and organisations for their generous financial support without which the Heritage Trail would not have been possible.